My high school Biology teacher always taught the autonomous nervous system with a parable: "Parents always worry when their children dare to hold their breath" he produced. "But I always tell them that there isn't any way that their kid will be able to carry through with it. At worst they'll faint, and the ANS will kick in again, innervating breathing." Whether or not those words comforted the parents (and whether or not he meant for them to) is open for debate, but in those words Mr. Steinkamp had imparted a bare truth about biology: You just can't betray it. But of course that does not mean you cannot try to outfox it. Holding your breath is just one form of disobedience against your own natural laws, and perhaps it is the most rudimentary. Others forms include eating an entire chocolate fudge cake, taking a bike ride up and down the mountains, embarking to understand Onsager's reciprocal relations in one night, and trying to follow four gripping clásicos in eighteen days. Sometimes too much of a good thing just gets damned awful. Certainly that is how it felt as an air of rabidity swept nearly everyone in the Bernabéu, although it was only Madrid who collapsed under it. As I wrote in my last piece, in Wednesday's match I was hoping to witness Mourinho continue to tinker with his tactical experiments against a Barça side who have not been more depleted in recent times. I was taken in by the complexity of his defensive arrangements, but when the logic behind that cynical surfeit was lost there was nothing left to defend it. More crucially when that logic was lost the entire strategy fell. Most critics and commentators tend to label Mourinho's tactical philosophy in broad terms. This is a problematic way to describe any team's tactics, but it is doubly so for Mourinho's Madrid. Madrid have deferred to Barça being the superior side in terms of flowing, combinatorial football, but their current approach is far from a simple "park the bus" game plan. Under Mourinho, Madrid have been drilled to cut off specific supply points in the Barça line-up, and they have changed their targets in both of the previous matches. In the first match Pepe marked Messi out of the match, while in the second he focused more on Xavi. Frankly it is impossible to ensure that every Barça player has a terrible game on any night let alone on a clásico, so Mourinho has had to constantly assess, predict, and determine which Barça player(s) to focus his defensive stranglehold on. It's an approach with little margin for error and no margin for nonsense. Given that, it does little for Mourinho to complain about Pepe's red card. Its color will be debated, but in his passion to battle on the pitch Pepe completely lost sight of the grander scheme. Pepe may defend his lunge as a directed effort to win the ball, but considering strategy it was entirely aimless. 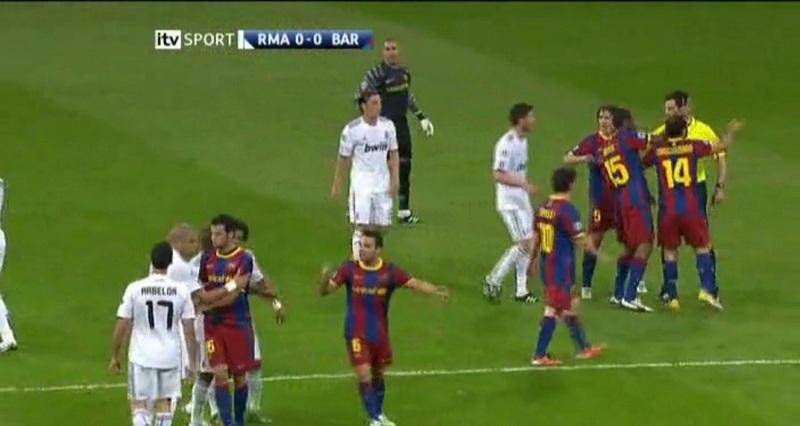 Damningly unnecessary, it occurred in Barça's third of the pitch with Barça posing little risk of a counter attack. Both of Madrid's other midfielders, Xabi and Lass, were a safe distance behind the ball, and Di Maria was also present on the left wing to stymie Alves's run, need be. Pepe's thoughtlessness highlighted the reason why there was such an acrimonious reception to the match from the casual observer. It is not that the preceding two matches were not as testy or competitive, but in this third match one could not help that both teams were drawn to be cynical for no constructive reason. Unsurprisingly this negative football did not help either team win the match, and specifically it caused Madrid to lose. After Madrid were reduced to ten men, Guardiola's options suddenly multiplied. Against ten men, Guardiola was able to exchange David Villa for Afellay, which he might not have otherwise. Because the score was 0-0, normally one would not want to substitute a goalscoring forward with the calibre of Villa even though he was playing poorly, but against ten men Guardiola easily inserted Afellay who is more of an assister and provider than Villa. Guardiola's decision was justified when Afellay's cross met Messi's feet and created the opener. Villa's terrible night was ended as Afellay's gleaming one began. But the most startling aspect of play after the red card was that Mourinho "made no effort to counter Barca's man advantage". He did not make a single change to strengthen Madrid's hold in the midfield, or frankly in any area. When the match begged most for a tactical change, one of the game's most heralded tacticians went to grab his coat and headed for the stands. Mourinho blatantly admitted defeat to Barca in his post-match press conference, but he had already done so in the match an hour earlier. Of course before the match, Mourinho played a different tune in his conferences, taking every shot he could to make defeat sour for his opponents, and in doing so it seemed he had succeeded. Guardiola uncharacteristically responded in an angry tirade before issuing the challenge, "Off the pitch, he has already won, as he has done all year. On the pitch, we'll see what happens." With his art of dissemination, Mourinho seemed to have won the verbal battle as he so often does. This is because Mourinho is savviest when he slyly underlines his verbal attacks as if they were undeniable truths ("Guardiola is the first coach in history to rue a good decision by a referee", he let slip). This frustrates opposing coaches to no end and causes them to make mistakes, but on this occasion, Guardiola was vindicated both on the pitch and afterwards in the media. On Wednesday, Mourinho was the one who became flustered in the most acute moments of the match, and afterwards he could only cut an angry, contemptuous figure as he rattled on aimless jibes to Barca, UEFA, the referees, and the press. At once his speech attacked seemingly everyone in football, yet at once it was not aimed at anyone in particular. 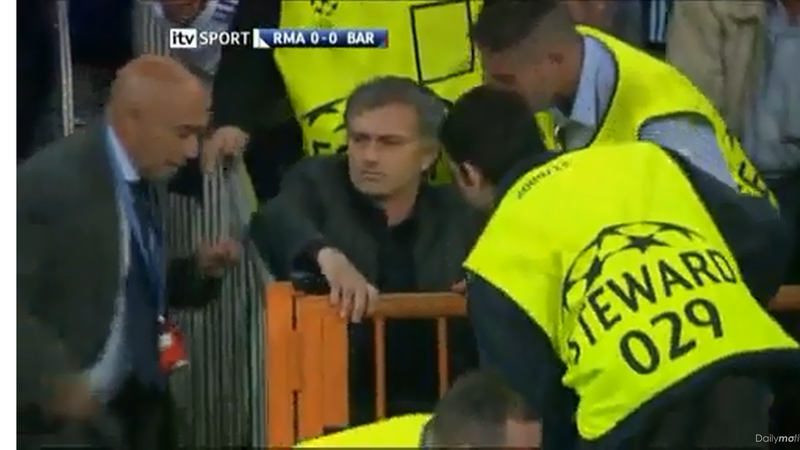 Mourinho was left trying to grab at anything he could after a thoroughly miserable match. But perhaps in his defeatist monologue, Mourinho was only concealing the fact that he could not have done anything to stop Lionel Messi. In an odd mix of self-pity and meltdown, Mourinho was only sequestering attention away from Messi who'd produced two of the greatest goals in the sport's history. It was a feat all the more spectacular as it had blossomed from the most infertile of premises. Before the match I noted that because Guardiola was limited in his tactical options, both in his deployment and instruction to his players, the players would have to take it upon themselves to carve a moment of brilliance. Essentially they would have to improvise to overcome Mourinho's defenses. Guardiola found that much needed improvisation in a player who's framed his legend on such bursts of pure genius: Lionel Messi. Afellay's gilded cross may have provided Messi with both the pace and position of the ball needed to tap it into the net, but Messi still needed to beat three Madrid defenders to reach it. The sheer brilliance of his run was reflected in its aftermath: Xabi Alonso could only wildly gesture while he lamented yielding a goal to the isolated forward in the box. As for the second goal, it was a classic mazy dribble where Messi is teed the ball by a teammate as he then proceeds to unravel the entire opposition, while his teammates merely stand and applaud. Both goals were startling in their splendor and in their contrast. For the first, Messi had to find space without the ball. For the second, he had to carve space with it. Perhaps the only commonality between them was how effortless they appeared. But for the longest time it seemed as though Messi would never find the breakthrough to win the match. Still if someone were to watch only those two goals they would think that he was dominating throughout it. That is a mark of class few possess. The quality of his goals speak of the effort Messi puts in to every run, every touch, and every move. After his first Ballon D'Or, the footballing world could not help but feel that as good as he was Messi could only get better. While before there was a slight tendency for him to be demoralized and marked out of matches, since then he has rose to the occasion repeatedly. Since then he has been the one to save Barça, and on this particular night, football. It was certainly fitting that Messi made both breakthroughs. For all the negativity and cynicism throughout the match, Messi was one of the few players most removed from it. He had to rise above the mind games, tread over the tackles, and block out the abuse of the madridistas, but the beauty was that by the end of the night he was enjoying all of it. My Biology teacher may have been right about most of us not being able to tread past our physical and mental boundaries, but on Wednesday night Messi did. It certainly was not easy for him, though he made it look so, but importantly he accepted the challenge without hesitation. So let your kids hold their breath and eat all the cookies from the jar, because with age they'll convert that daring into greater, more considerable feats. Otherwise God knows they may end up like Mourinho's Madrid on a night they can not afford to. So Mourinho's football is like Vaapaad, and game 3 was when he fell and lost to the dark side. Very well written and insightful post Gaurav! I really enjoyed reading it. Finally got a chance to watch Messi's first goal. I must admit, it was breathtaking. @Prince Thanks. You're right: Messi is enough reason to love football. @simplesplendid Thanks. I love the pictures on your site!